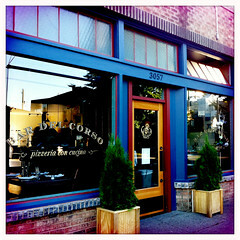 Bar del Corso is one of the restaurants on Beacon Avenue featured in a recent Seattle Met article. Photo by Wendi. Seattle Met’s Kathryn Robinson recently posted an article about three of Beacon Avenue’s restaurants: Bar del Corso, Travelers Thali House, and Inay’s Asian Pacific Cuisine, suggesting that with restaurants like these, Beacon Hill is now a neighborhood worth bringing your appetite to. About Bar del Corso, Robinson says “Full of neighbors sharing wine and chatting across tables, it was a true third place from the moment it opened in July.” Travelers “now has the space to do justice” to the thali and street food its owners have served until now from a portion of a small retail store on Capitol Hill. And Inay’s food, says Robinson, is “accorded solid treatment by Inay’s son Ernie”—but she even more highly recommends eating there on Friday evenings, when waiter Louie transforms into drag queen waiter Atasha for a lip sync diva tribute. Commenters on the article and on the Beacon Hill mailing list noted that El Quetzal was left out, as was Baja Bistro. Perhaps Robinson wanted to focus on newer restaurants, though Inay’s has been around for several years. I have been reading this blog for sometime now and there is hardly ever a word mentioned about “INAY’s Asian Pacific Cuisine” except perhaps the time they got a few points knocked of their food inspection report or if there is a concil meeting held there. That “INAY’s” has become recognized in other periodicals, should that not be celebrated as an acomplishment for the efforts that has been put into the Beacon Hill Nieghboorhood? As a blog site that claims to recognize the diversity of this niehborhood I often find that the businesses mention and supported seems a bit narrow. Negating the fact that “INAY’s” was chosen for this article is a dis service and somewhat demeaning to those longtime residence and businesses that are found here on Beacon Hill. “Negating the fact that ‘INAY’s’ was chosen for this article is a dis service” — I’m not sure what you mean by this. The reason I commented on Inay’s the way I did is because the article said “Beacon Hill has never been a terribly auspicious place to bring an appetite. Until now.” And then focused on two brand-new restaurants, plus Inay’s. Inay’s was sort of the odd one out there, since it’s been open for years and is not a new thing on the Hill. If they were going to mention Inay’s, it was strange that they didn’t also mention Baja Bistro or El Quetzal, or some of the other local restaurants. We have mentioned Inay’s quite a few times here, including mentions of “Atasha’s” performances. But Travelers and Bar del Corso have gotten more mention lately because they are new, and that is newsworthy. I think Inay’s opened before the blog started, so we didn’t really get the chance to cover them then. Anyway, I think you are misinterpreting what we wrote here. It’s great that all three restaurants are getting press! Whatever happened to the Tippe and Drague Alehouse that was supposed to open in the old Rockit space? Shane, I haven’t heard anything recently. Last I heard they were still working on it. Tippe & Drague Alehouse is still working on permitting, getting closer. Had hoped to open late summer, now maybe before the end of the year. BaRen is right- Inays needs to be highlighted. If not for the food, service, & atmosphere, then for our local celebrity, Louie! Yay! Still looking forward to the alehouse opening. I guess I need to try Inay’s again. I wasn’t too impressed when I went soon after they opened. I suppose it’s time to try it again. We ate at Bar del Corso on friday night and couldn’t believe it was as packed as it was. Not a huge line outside like right after it opened, but definitely a decent wait for a table. However, My wife and I were able to walk right up to the bar, where there was always an empty seat. It was actually nice to sit right by the food prep and servers; everyone was very nice and we got a couple “tasters” while waiting for the food.